The Bay Area Parents Leadership Action Network (PLAN) are taking an ambitious step toward improving the dialogue between Oakland’s public schools and parents by hosting the first-ever teacher-parent summit on April 26. This Thursday at 5:30pm, at the International Community School (2825 International Blvd., Oakland), nearly 100 parents, teachers, school administrators and educational leaders will gather to discuss how to improve the education system for the most at-risk children and youth in Oakland’s communities. By bringing parents together with the very people who shape their children’s lives, PLAN is hoping that Oakland’s education system will finally favor the young. No matter the outcome, the conversation needs to happen. Last week, we were lucky enough to watch the beautiful documentary “Jiro Dreams of Sushi.” Initially, we were excited for this movie because we’re huge sushi lovers. But after watching the movie, it was clear it’s a film for anyone who is passionate about what they do, and who wants to be experts at their craft, not for money, not for fame, but for personal growth. 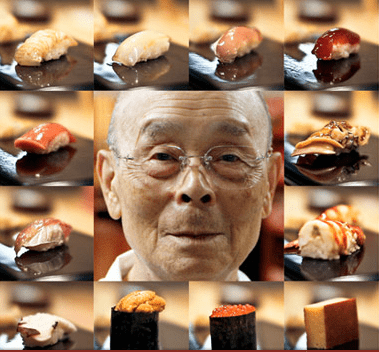 The obsession of Jiro Ono, the titular sushi artist, drives him to eat, sleep and yes, dream of sushi. He believes in perfection through repetition, a philosophy that is also shared by one of Change Communications’ clients, Kihon Games. Kihon named themselves after the Japanese phrase that means perfection through repetition. Like Kihon, Jiro believes in learning his craft better than anyone, and that means perfecting the little things, whether it’s the perfect way of fanning sushi rice, or the perfect time to massage an octopus (45 minutes, according to Jiro). In the movie, Jiro states that he doesn’t do what he does for money. Of course, it doesn’t hurt that he can command $300 per person at his 10-seat restaurant. But regardless of what price Jiro can put on his perfection, it’s very clear that this is not a man driven by money or the kind of fame that many entrepreneurs in Silicon Valley (or just anyone with a Twitter account) seem to crave. Sometimes, for some people, it really is about the craft. And you can be your own best competition. Being great at something is truly a lost art. If you are lucky enough to be in a city screening Jiro Dreams of Sushi, go check it out and uncover your inner Jiro.